“It’s no big deal,” I said. My first colonoscopy was performed on a Wednesday. The doctor was concerned enough with the results that he scheduled a colectomy — an invasive abdominal surgery — two days later. No big deal, I said. I even objected when my wife suggested that I would have to cancel an eye exam the following week. “I can make it,” I said. doctor gave me following my colonoscopy. One, I was starving. My mind was not at its peak. At that point in time I had not had solid food beyond clear liquids for three days. I was functioning on about 500 calories a day; there are only so many cups of vegetable broth you can stomach. Second, I think I knew at some level. I heard the words the doctor said. I even heard and intellectually accepted the seriousness of abdominal surgery of any kind. With a day-after-tomorrow surgery appointment, I did not have much time to process what was happening. Though, my wife and I talked some about the possibility that the biopsy following surgery would indicate cancer, we had very little time to discuss it. I had life-routines to reschedule and bow out of before surgery. There were a few quiet tears that Wednesday evening as my wife and I pondered the unknown. It was my son Isaac, having flown in from Oakland to be with us, who raised the question most directly with me the next day. His pastoral tone was reassuring. He allowed me to entertain and discuss as much as I was comfortable with discussing. So, while I did not totally ignore the possibilities, I did not yet have time to explore in depth the magnitude of what I was facing. I think my mind was protecting me. Human psychology sometimes builds up our acceptance of reality in small bits over time in much the way physical exercise gradually builds up muscle tone. Just as I had an unexpressed just-beneath-the-surface expectation that the colonoscopy would find a problem, I had an expectation that all would be well. Though it is irrational, I trusted my instinct that there was no cancer. I am beloved. My wife of nearly thirty-five years is my Imzadi, my soul-mate, and my other half. Whatever I would learn about my health in the coming weeks I knew to the marrow of my bones that she and I would face it together. My son, who I told, “you don’t have to come” loves me. He would not only take care of me but he would ground his mother, my wife, by his mere presence. Whatever was to come, his love is of divine origin even should I be diagnosed with cancer and face chemotherapy. My life lens and these fundamental knowings, gave me the luxury to slowly come to terms with the fears, anxieties, and significance of the surgery I awaited. These knowings allowed me to lament that God Hides God’s Face From Me without fear of retribution. My family’s loving presence, their patience with my denial, my perception of the divine, and my psychology allowed me to come to terms with my reality on, well, on my own terms. 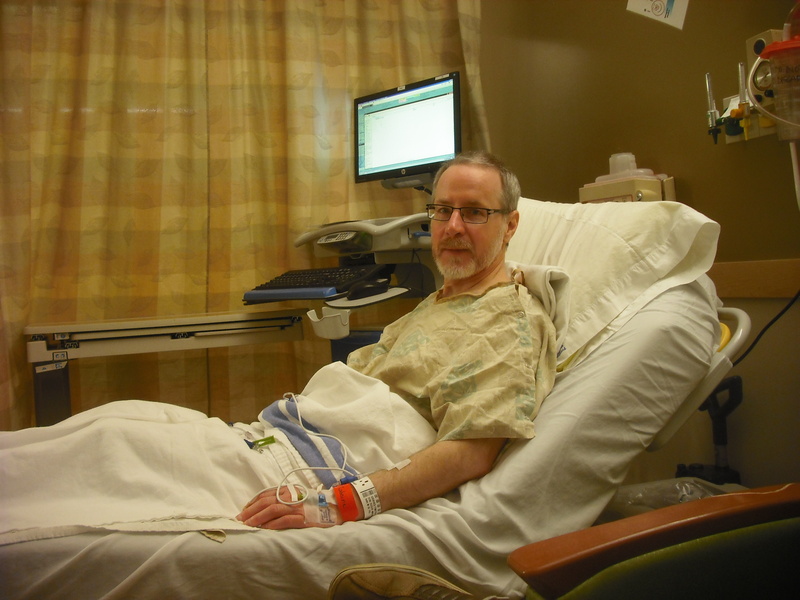 This is the fourth of multiple posts about my experiences of surgery and recovery following a colonoscopy. beautiful. thank you for your courage – you are an inspiration and you have my support & prayers.